Compared with other major home appliances such as clothes washers, dryers, and cooking equipment, dishwashers are both less pervasive and less likely to be used when available. Of the 80 million households that have a dishwasher, 16 million (almost 20%) did not use their dishwasher in 2015, based on data from EIA’s Residential Energy Consumption Survey (RECS). On the whole, a little more than half (54%) of all U.S. households both have a dishwasher and use it at least once a week. Since its first cycle in 1978, RECS has captured a wide range of home energy and appliance characteristics. Updates to the 2015 RECS questionnaire allowed EIA to collect information on the frequency of use of appliances, including major appliances that were not being used at all. This information can be compared across demographic characteristics, revealing information that compares use or nonuse across regions, housing types, household sizes, and household income levels. 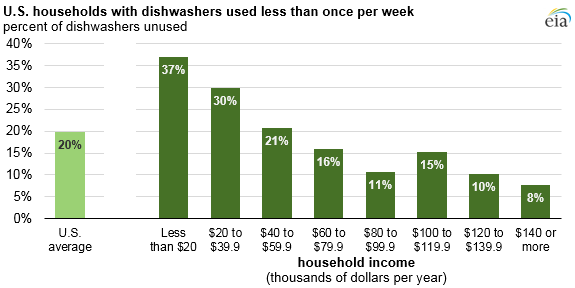 For example, lower income households are more likely to have older, unused dishwashers. Analysis from the U.S. Department of Energy and U.S. Environmental Protection Agency’s ENERGY STAR program suggests that dishwashers save water and energy compared with washing by hand. 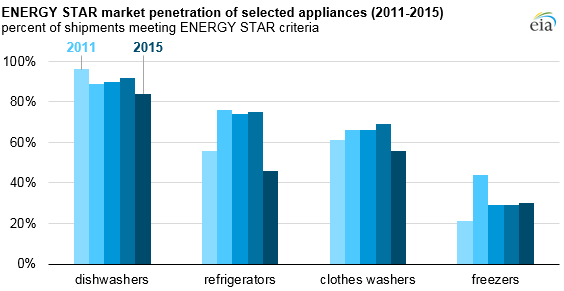 New dishwashers are consistently among the products with the highest rates of ENERGY STAR qualification: 84% of models shipped to retailers in 2015 met the ENERGY STAR criteria. 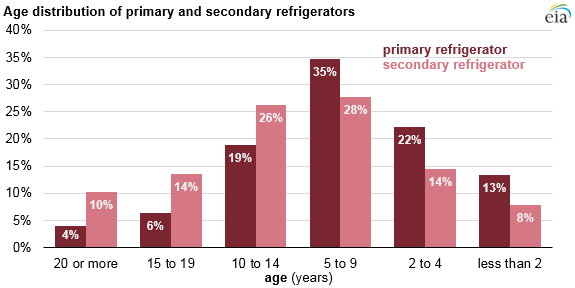 Secondary refrigerators are likely another example of underused appliances in American homes. Since the first RECS in 1978, results have shown that virtually all homes in the United States have a refrigerator. In recent years, the share of homes with more than one refrigerator has grown rapidly. 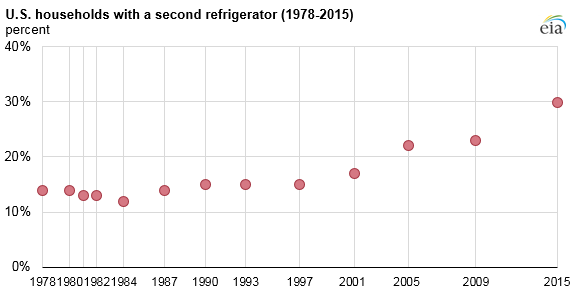 Since 1997, the percentage of households with a second refrigerator has doubled to 30% of all homes. Second refrigerators, often located in a garage or basement, tend to be older and less efficient than primary refrigerators. Refrigerators built before 1990 likely consume at least 1,000 kilowatthours per year—more than double the annual consumption of similarly sized new refrigerators and roughly 10% of average household electricity consumption. To reduce the prevalence of older, less efficient second refrigerators, many electric utilities and states run efficiency programs that offer financial incentives to remove and recycle second refrigerators. The 2017 EIA Energy Conference will be held June 26 and 27 in Washington, DC. Registration is open through midday on June 22. 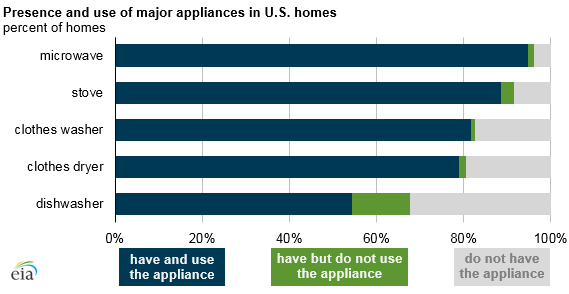 More information about the appliances and energy-consuming equipment in American homes is available through EIA’s Residential Energy Consumption Survey.